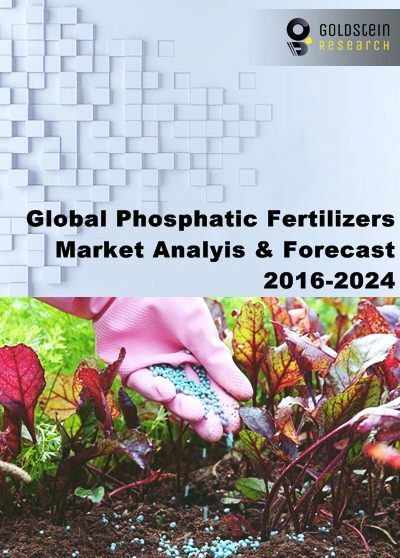 Global phosphatic fertilizers market is growing rapidly on the back of rising population and significantly increased demand for food. Feeding a population of 9 billion in 2050 will put pressure on the limited farm lands and will rely upon the availability of plant nutrients corresponding with the necessary increase in productivity and the deployment of new plant and farming technologies. Global demand for total fertilizer nutrients is expected to grow at 1.8% per annum from 2016 to 2024. The demand for phosphate, nitrogen and potash is projected to grow annually at 2.2, 1.4 and 2.6 percent over the forecast period. Global phosphate rock supply would grow by 10% compared with 2016 in 2024. Large expansion will majorly occur in Africa and West Asia, collectively accounting for more than 70% of the net increase. Modern farming method to increase the productivity and crop yield are majorly dependent on inorganic fertilizers. Rising demand for fertilizers to meet increased demand for food across the globe has significantly fueled the growth of phosphatic fertilizers market. The global balance between grain supply-demand has improved in 2015-2016 marketing season as compared to early 2015. The global cereal production in 2015 has reached 2,499,000,000 tonnes as per the reports of Food and Agriculture Organization of UN (FAO). World fertilizer nutrient consumption has reached 187,900,000 tonnes in 2016, up by 2.0% over 2015. Rising demand for animal protein and dairy products in developing countries has also resulted in corresponding increase in demand for phosphatic fertilizers, as added demand for protein has effect on grain demand which is a primary feed for livestock. Depending on the meat type, between 2 kg of grain (for poultry) and more than 10 kg of grain (for beef) is required to produce 1 Kg of protein rich meat. Further, increased demand for dairy products and eggs, which requires intensive feeding of the animals, has also raised the demand for phosphatic fertilizers to increase the yield grains for livestock. However, stringent government environmental regulations regarding the usage of inorganic fertilizers as they impact air, water and soil quality which contribute to greenhouse gases and adversely impact biodiversity. For instance, between 2010 and 2013 many states in U.S. banned the use of phosphorous fertilizers in order to prevent high level of phosphorous in water bodies which can lead to high excessive algae and aquatic plant growth which can harm aquatic life. The global phosphatic fertilizers market accounted for USD 57.8 billion in 2016 and is estimated to reach USD 70.2 billion by the end of 2024. Further, the market is projected to expand at a CAGR of 3.5 over the forecast period. Geographically, strongest growth is predicted to occur in present largest potash fertilizers markets of Brazil, India and China. Asia Pacific region accounted for the largest market share of more than 45% in global phosphatic fertilizers market. China is the major producer of the phosphatic fertilizers in the region and the production is expected to grow significantly owing to rise in food crop demand in the region. Other big potash markets such as Latin America and Africa will continue to show strong demand growth over the forecast period. Global phosphatic fertilizers capacity would grow by 8.2 Mt to 56.4 Mt in 2024. Large capacity additions are expected in Morocco and Saudi Arabia.